Kids flower crafts are perfect for spring or summer kids crafts. 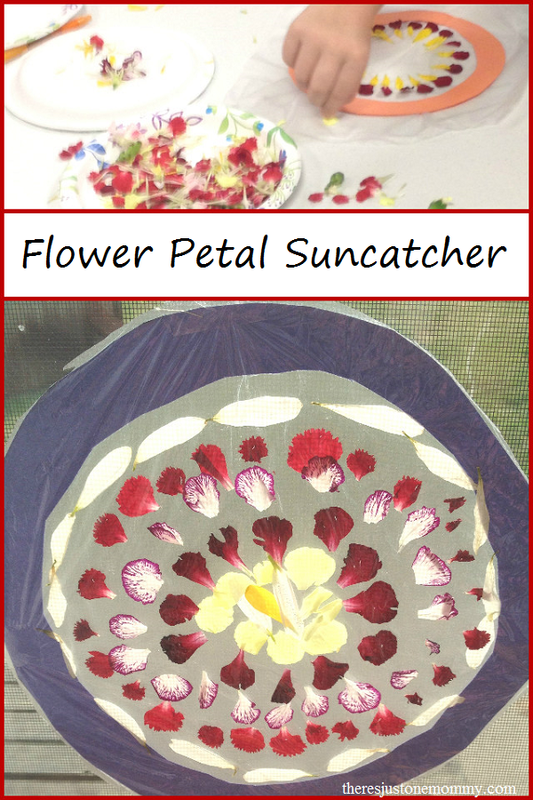 This simple flower petal suncatcher is fun for kids of all ages, from toddlers to elementary school. 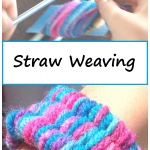 We had fun doing it as a camp craft with Girl Scouts. If you have access to wildflowers and/or flowers in your flowerbed, let your children pick some before starting this craft. Impatiens, petunias, geraniums, roses, and daisies are perfect for this flower craft. Once you have a selection of flowers, have your child pull off the petals. 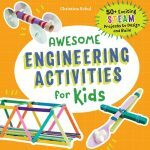 This is great for working on fine motor skills and developing the proprioception sense, which tells us how much force we need to do certain activities. 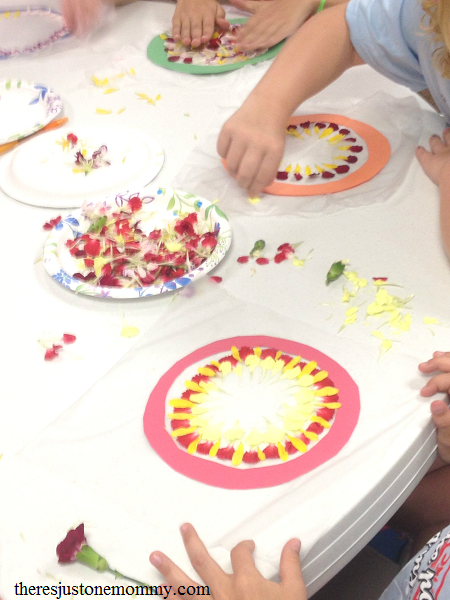 If you have several children doing the activity, you may want to put all the petals on paper plates for easy sharing. Once your flower petals are ready, have your child use a paper plate to trace a circle onto a piece of construction paper. Cut out the circle, and then gently fold the paper in half to cut out a circle inside, leaving a 1/2 inch thick ring of colored paper to make your suncatcher with. 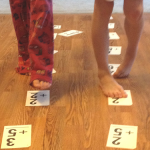 An adult may need to help younger children with this step. Press the paper circle to the center. Once your child is finished, cut another piece of plastic wrap to cover the other side of the suncatcher. Press the plastic wrap together and rub it to make sure it seals. Use scissors to trim off the excess. Use a small piece of clear tape to hang it in a sunny window and enjoy! 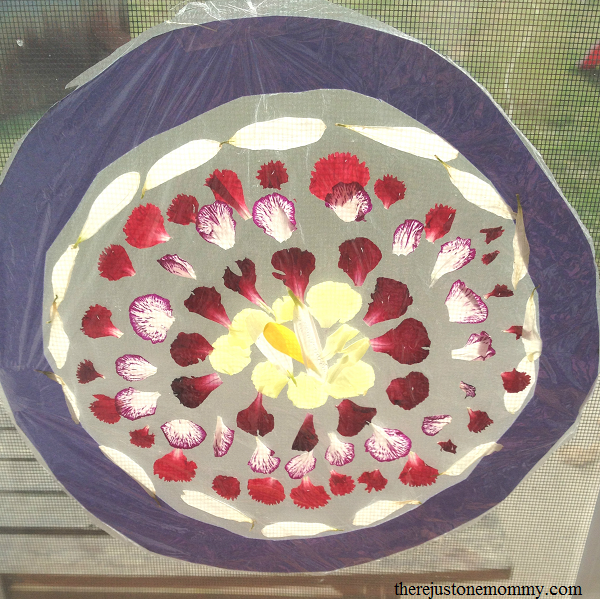 Your child may choose to create a pattern with the flower petals. They can also create pictures with them like we did with our leaf creatures craft. Whatever they choose, they will wind up with a beautiful flower petal suncatcher they will be proud to display. Hi! 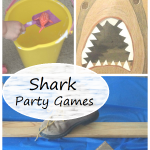 This is a wonderful summer activity for kids! Thank you for sharing this with my No Rules Weekend Blog Party I wanted to let you know that I have chosen this as one of my Monday Special Features.